Call me a miserable child but when I was younger, I didn’t visit a circus. Not once. I have a vague recollection of a fifth birthday party, in which a clown appeared. I don’t remember feeling particularly impressed by him and was more interested in my new Polly Pocket necklace and leotard (early 1990s). I do remember, however, the film Dumbo and I hated it. It made me sad and I only ever watched it the once. Perhaps that’s where my general apathy towards circuses stemmed from. 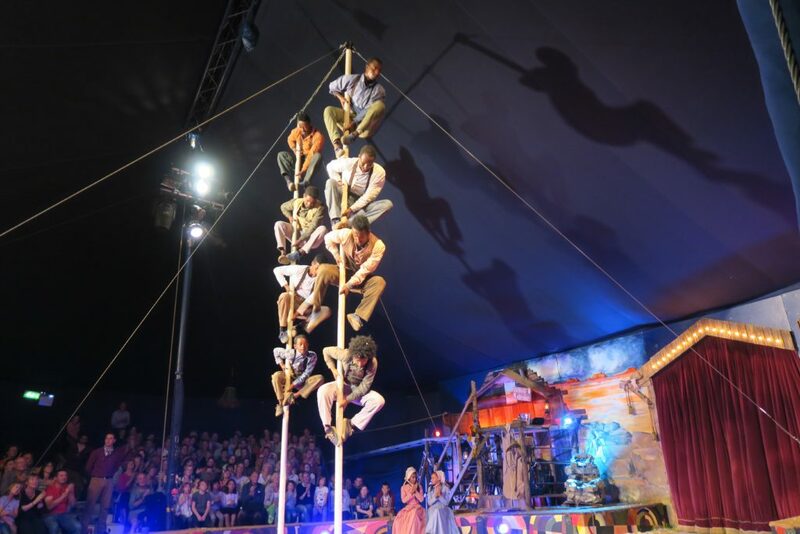 So, it was ironic that two nights ago, and at the brink of turning the big 3-0, I found myself making my way to an actual circus: Giffords Circus to be exact in Little Barrington, the Cotswolds. 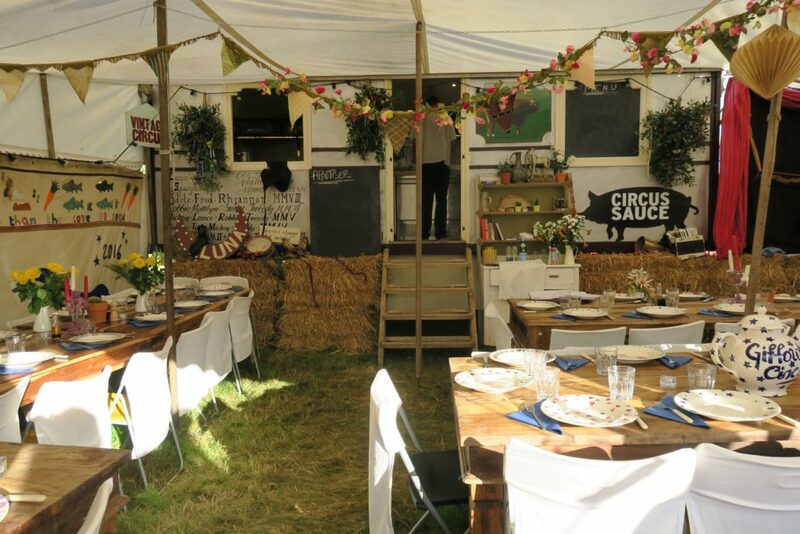 A traditional English circus, Giffords tours this beautiful part of the world each summer, setting up not only the circus but its travelling restaurant: Circus Sauce, on quaint village greens – bringing with it a touch of magic to sleepy streets. 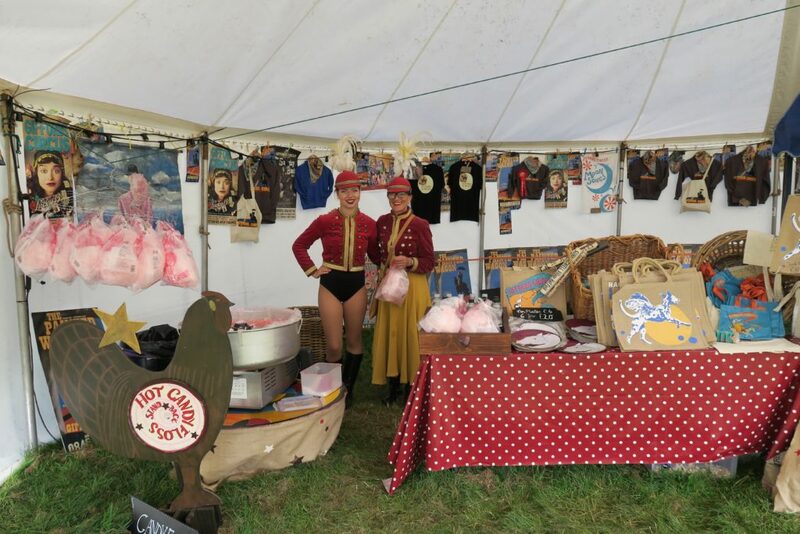 Stepping out of the car into the warm summer’s evening, I was met with the irresistible smell of candy floss and sounds of tinkling organ pipes, as children and adults made their way to a large white tent, ready for the show to start. The scene was completely enchanting; straight out of the pages of an Enid Blyton book. 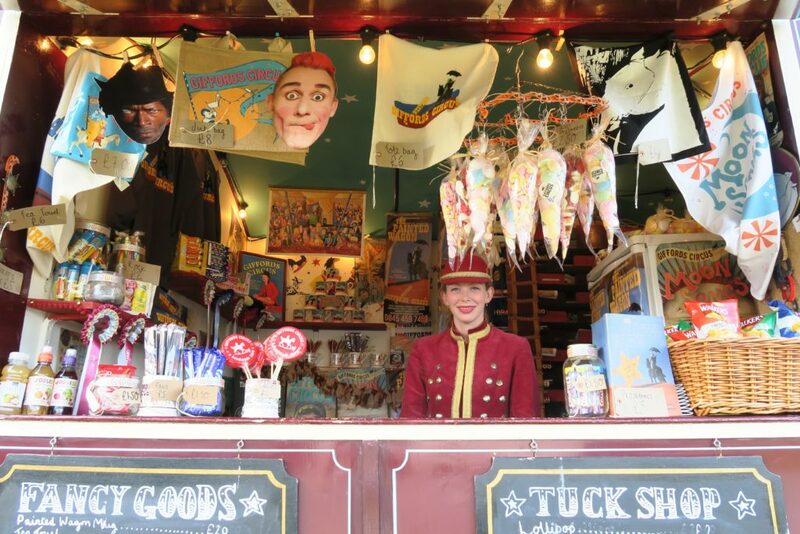 I couldn’t resist taking a look at the whimsical stalls, bursting with insanely sweet merchandise and manned by glamorous ladies in traditional red velvet jackets. One of the reasons I haven’t been keen on visiting a circus before is that slap-stick comedy makes me cringe. I dislike it, hugely. And so, despite the magical surroundings, as I took my seat on the front row (whey!) I was a little apprehensive of what was to come. Visions of screaming children and ‘he’s behind you!’ (or is that pantomime?) for hours on end were lingering at the back of my mind. As the lights dimmed, I took a deep breath and prepared for a long evening. 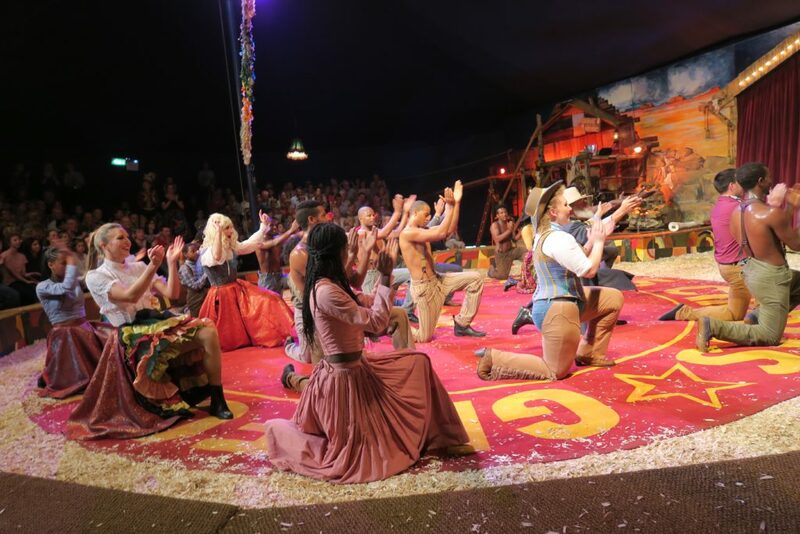 One important point to make before I tell you about the show is that the animals in Giffords Circus – two horses, one donkey, one chicken (an ex battery hen), and three dogs – are all extremely well cared for. 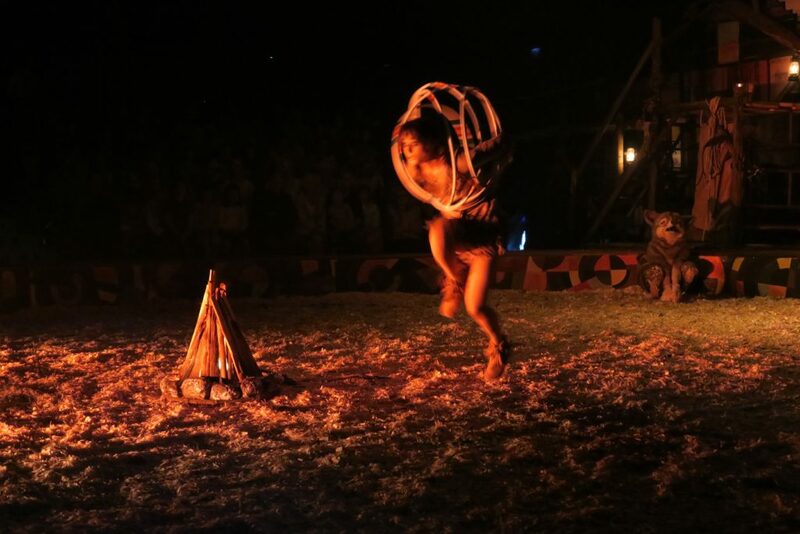 As an animal lover, I wouldn’t have gone along as a happy punter without being positive that the show was cruelty-free. 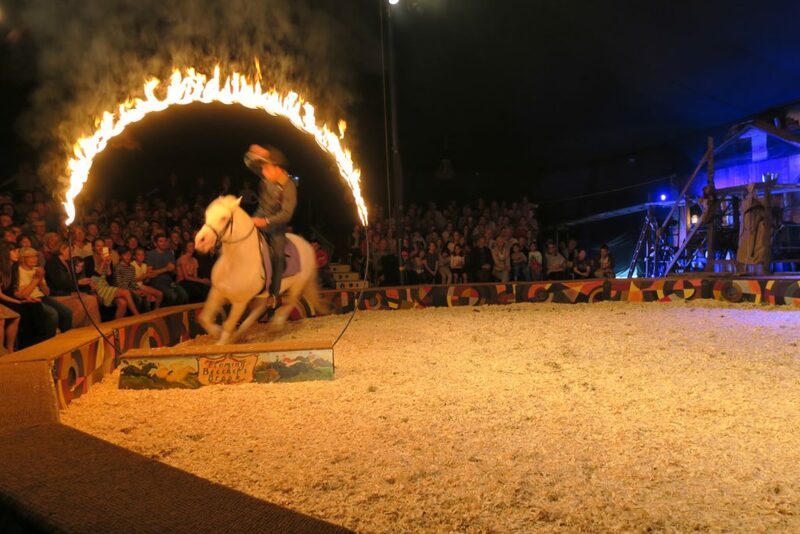 The horses spend some of the year living ‘wild’ in the fields of the Cotswolds and are trained by the owners of the circus. They were beautiful and clearly relaxed inside the circus tent. Despite the horses glamour, however, the star of the show for me, was the chicken. Her big act came early on when she ran around the ring of the circus floor, picking up grain as she went, before dramatically exiting through her own little cardboard tunnel. Yup. And she was just the warm-up act. 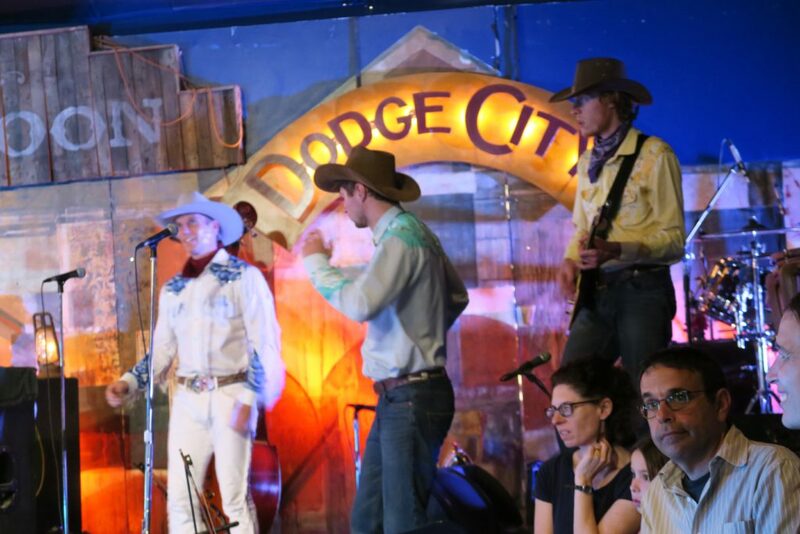 The rest of the first half entailed a rope twirling cowgirl, a hula hoop fischinado, a horse jumping through flames and more. The entertainment was flowing and I didn’t need to fake laugh. Not once. After 45 minutes of sitting rooted to my seat, unable to take my eyes off the ring, it was time for the interval. 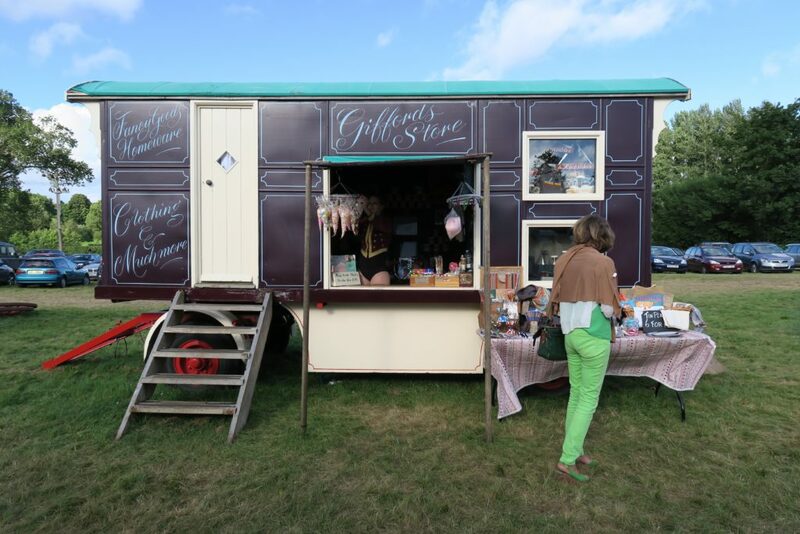 Outside, people flocked to buy fresh pizza, collect their drinks and sit out amongst the gentle tinkling music and enjoy a rare warm evening – in the middle of a field, in England. There was an intimate, family feel to it all. 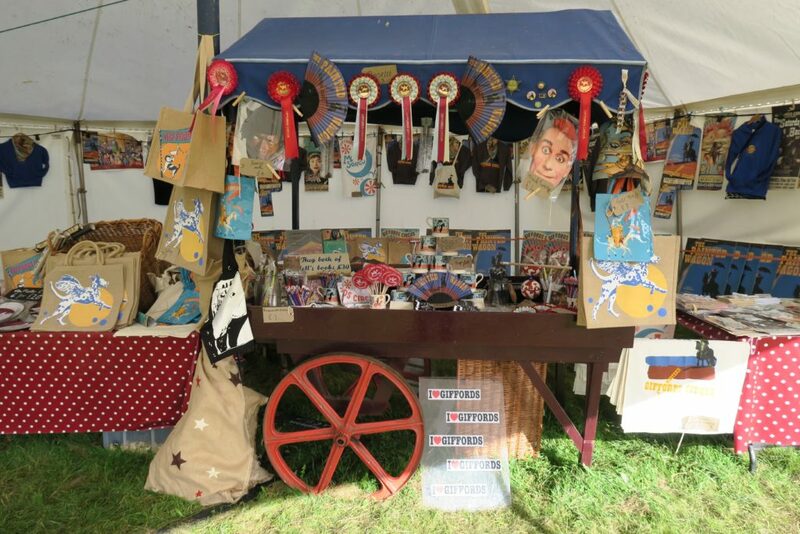 Indeed, all of the performers’ costumes are made by hand by the team and the wagons painted on the farm. The circus band were also an unexpected surprise for me – playing catchy music the whole way through the show. I even did a toe wiggle to Cotton Eye Joe (if you don’t know that song, discos at school must have been dismal for you). It was clear, like all of the performers, that their lives was dedicated to the circus – they oozed fun and were far cooler than I’ll ever, ever be. The second half, I think, was enjoyed more by the adults than the children. We had got into this, and we were letting our hair down. From ultra flexible ladies dangling from hoops high above us to a group of incredibly muscular, sweaty men throwing themselves around the ring, there was plenty for the grown-ups to enjoy, as well as the children. I was even asked if I enjoyed a sausage at night time by Tweedy the clown. The little girl next to me seemed a little confused when I let out a cackle. What surprised me the most about the show, and I may sound ignorant here, is the sheer skill of the performers. Rather than people slipping over on banana skins and blowing up balloons (as I had initially feared), these performers were at the top of their game and I couldn’t take my eyes off them. They were true entertainers and by the end of the show they had transformed me from a reserved and reluctant guest, to a whooping, clapping circus lover. I was a convert and so was the elderly man next to me. How had we missed this for so many years we asked one another? 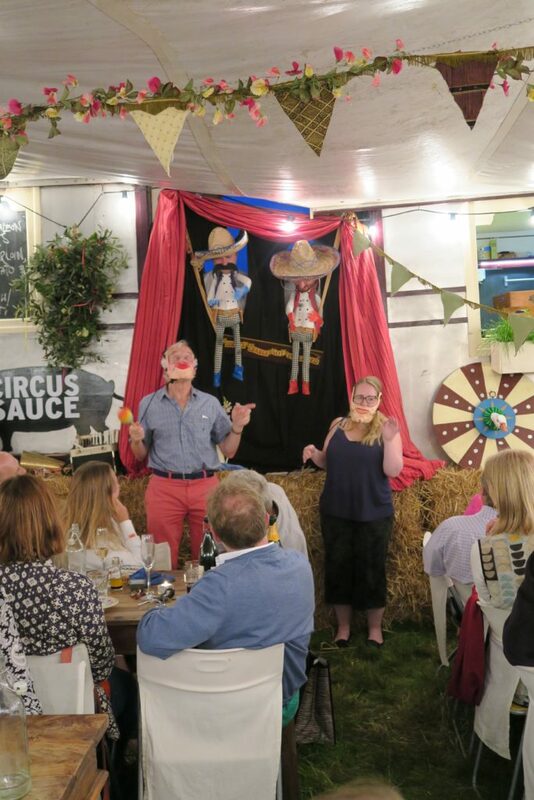 After the show, it was time to eat at Gifford’s travelling restaurant – Circus Sauce. Forget a droopy hot dog and stale popcorn, we were in for a treat with a three course-meal cooked freshly on site by the talented chefs. Inside the restaurant tent, we were met by flickering candles, quirky wall hangings and Emma Bridgewater tableware (she is the owner’s sister, quite conveniently). It felt like a quintessential English evening with fresh strawberries, local salmon and beef fillet on the menu. We were seated on long tables, sharing large platters between groups. This meant there was a lovely atmosphere as strangers exchanged their favourite acts of the night with one another. I think there was a general consensus amongst the women that the male gymnasts were the highlight. As a newly married woman, it will be a memory I will squirrel away for myself for a bad day when my husband forgets my anniversary or something. The final surprise of the evening was a tiny puppet show from two of the circus staff, who to my delight, pulled my friend up to the front of the tent to partake in a little dancing and Spanish singing. It was simple, childish fun that allowed us to tap into our inner child and just be silly. Perhaps that was the best part of the whole experience for me. Whilst children can spend their days running wild, as adults we can’t. 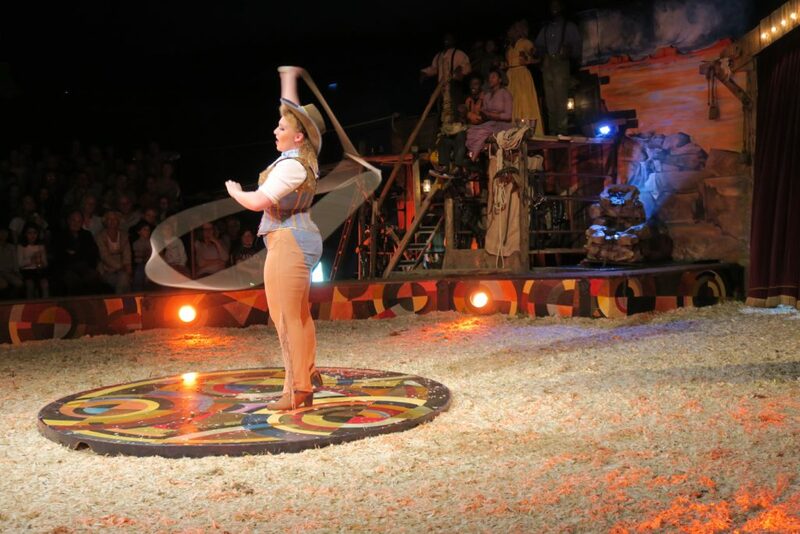 An evening at Giffords Circus, however, amongst the popping candy, a performing chicken and an energetic performance of the can-can, transported me to a magical bubble far, far away from the mundane reality of every day life. It was a true slice of escapism. The only question that remains: is is too late to run away to the circus?